February is more than the month of love Uptown – it’s also the month of wins! Cuddle up and roast wins by the fire that will be produced from two huge bonuses plus 200 Free Millionaire Spins Rewards! Make a deposit of as little $30 and open your heart to Mid-February wining opportunities when you play with a 1st 100% Match + 50 Free God of Wealth Spins, continue the loving with a 2nd 150% Bonus + 100 Cleopatra’s Gold Spins and burst into emotions with a 200 Free Millionaire Spins Reward you’ll be spinning in our popular Aztec’s Treasure slot! February isn’t over until you claim some of the most exciting and loveable wins yet when you deposit as little as $30! 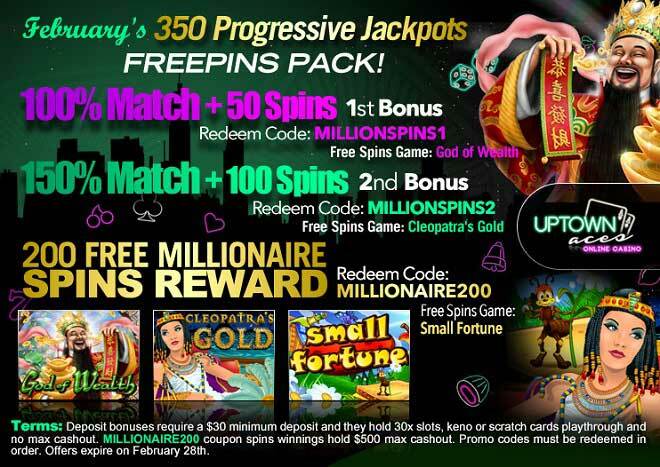 200 Free Millionaire FREE Spins Reward!